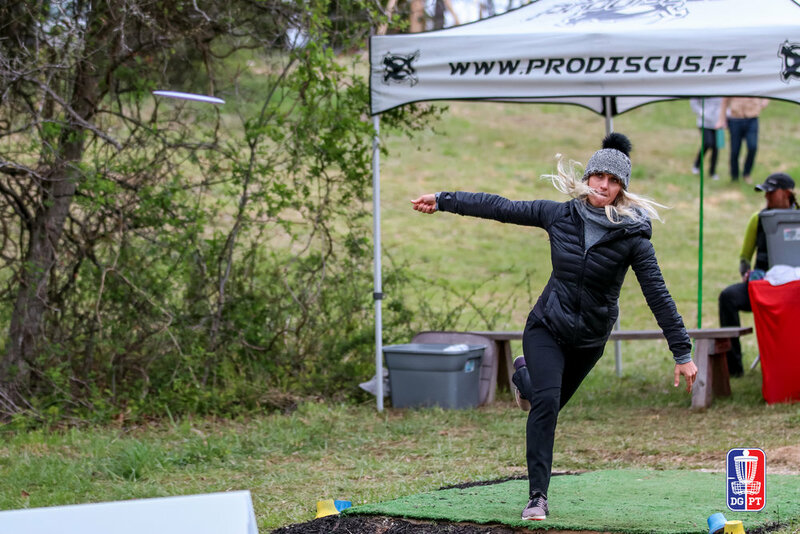 Chris Dickerson’s win streak ended at the Jonesboro Open, but Will Schusterick turned heads in his tour debut and Catrina Allen battled snowy conditions on the way to a top-5 finish. Dickerson entered the Disc Golf Pro Tour event having won his last 13 tournaments dating back to late last year. He won his first 10 tournaments of 2018 before totaling a 19-under par 173 for a solid 11th place showing in Jonesboro, Ark. Schusterick was also playing in his first event on tour, missing the Las Vegas Challenge and The Memorial Championship to rehab a shoulder injury. He opened the tournament with a 1043-rated round and finished with a 1034-rated round to land in 13th, just two strokes behind Dickerson. Seppo Paju also posted a top-20 finish with a 15-under par 177. The Open Women’s early tee times meant dealing with harsh, cold conditions and even snowfall on Saturday. Allen bested the elements to shoot the hot round in the snow before finishing in fifth at a 6-over par 204. A handful of Prodigy teammates were in Lumberton, Miss., for the Southern Nationals Doubles Championships. Matt Orum and Cameron Colglazier teamed up to take the win with Michael Gibney and Colin Forehand lurking a stroke behind. Orum and Colglazier came back from a four stroke deficit, two behind Gibney and Forehand, after the first round. Jeremie Gates and his partner finished fourth. Back in singles action, Dallas Albright claimed the NorCal Winter Series title, winning NWCS Presents: The Brooktrails Finale in Willits, Calif. Albright shot a 17-under par 186 for a three stroke win over teammate Ryan Dickson. Albright shot the hot round in the second round while Dickson had the best score in the final round. Prodigy was also well represented at Copper Green in Birmingham, Ala., claiming at least a share of the top four spots. Dylan Holt and Austin Lytle tied for the win, and Holt took the win in a playoff. The pair shot matching 13-under par 99s. Benjamin Page finished three strokes back in third and Matt Versola tied for fourth with a 3-under par 109. Clayton Morgan won the ODSA Flex Tour - St. Catharines, a one round event in St. Catharines, Ontario, Canada. Morgan’s 6-under par 48 was the winning score by a stroke.